Top Reasons to purchase genuine Volvo wiper blades? 1. Volvo genuine wiper blades are the best there is for a Volvo and its owner. They offer the best possible visibility, safety and performance in all weather, all year round and at all speeds. Volvo wiper blades are customized and thoroughly tested to perfectly fit each individual Volvo model. They therefore perform better and are more durable than most generic blades. 2. With age, the performance of the wiper blades deteriorates. This leads to reduced visibility, vibrations, noise and premature wear, which in turn means reduced safety and a less enjoyable drive. It is therefore important to check the status of the wiper blades twice a year, and to replace them annually. This is true even if they have not been in use for some time. The rubber ages when exposed to the sun, dirt and water. Scratches or chips in the window will also compromise the wiping performance, resulting in lines of water or smearing. 3. Volvo genuine wiper blades are tested and customized to accommodate use with each individual Volvo model. They therefore perform their task better and with a longer lifespan than many generic wiper blades. In terms of testing, Volvo wiper blades stand out compared to generic brands. Not only have Volvo genuine wiper blades undergone four laboratory tests; they have also been carefully tested under real and extreme conditions on the road in various climates and outdoor environments. Combining laboratory tests with real outdoor conditions is what makes Volvo genuine wiper parts unique compared to the competition. 4. Volvo genuine wiper blades have among the highest portion of graphite in the rubber compound on the market. This means that Volvo wiper blades are less prone to vibrations and disturbing noise. Together with the exact curvature, the rubber compound and the graphite layer on the Volvo wiper blades are customized for optimized contact with the windshield, which means the best possible visibility and safety. Volvo wiper blades do the work they are supposed to throughout their entire service life. 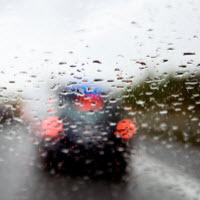 Generic wiper blades often work properly for a short period of time, but their properties rapidly decline due to the less durable materials used. This important fact is not obvious until it is too late. Think of a dark night with snow, rain and heavy wind. This is a perfect example of a situation when the wiper blades should function fully so that the driver and his passengers can be safe. Volvo Genuine Wiper Blades provide that safety. 5. Genuine Volvo wiper blades are an exact fit, custom made, long lasting, quieter, safer and perform better than generic brands.